Rome police have seized eight villas built illegally by a mafia clan in a south-eastern suburb and bulldozers are going to demolish them. Italian Interior Minister Matteo Salvini and Rome Mayor Virginia Raggi were at the scene as 600 police took over the Casamonica clan villas. A video posted on the mayor's Facebook page showed police smashing their way into one of the opulent villas. Italy's new populist government has targeted Casamonica properties before. The clan has ethnic Roma (Gypsy) roots and in June some Casamonica members attacked Mr Salvini's plan to carry out a census of Italy's Roma population. His nationalist League party is stridently anti-immigration. Ms Raggi said the villas, in the Quadraro district, violated Rome's construction and landscape laws and some "incorporated whole sections of the historic Felice Aqueduct". She is in the populist Five Star Movement (M5S), which is ruling Italy in coalition with the League. "Today is an historic day for the city of Rome and for Romans," she said. "We are putting an end to years of illegality and are sending a strong statement to the Casamonica clan." About 30 Casamonica family members were found to be living in the villas. Some left the scene by car, others on foot, Italy's Corriere della Sera daily reported. Drugs were found during the evictions. The operation began at dawn. 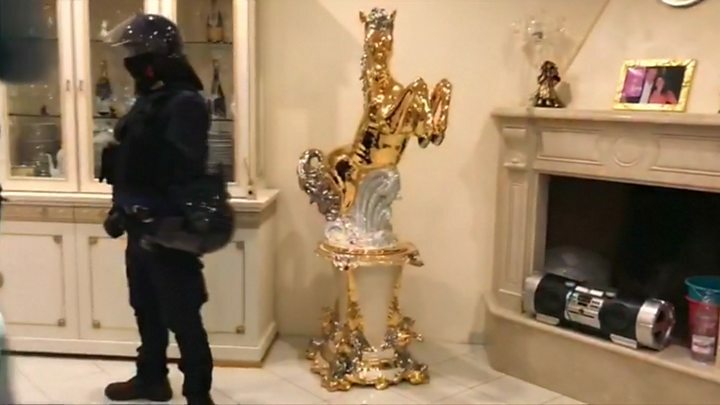 The mayor's video showed a gaudy interior, with golden animal statuettes and a ceiling fresco. On Saturday a judge cleared Ms Raggi of accusations that she had lied over a senior appointment in her office. She had been accused of false testimony in connection with Renato Marra, nominated to head the Rome tourism department. Prosecutors had sought a 10-month prison sentence for her. She has faced much criticism over Rome's creaking infrastructure, including serious problems with waste disposal. She said the Casamonica villas had been built 30 years ago and symbolised the authorities' "impotence in the face of mobsters". She said it was the most impressive operation ever by the capital's police force against the Rome mafia. Police have also conducted several raids this year against properties run by the Spada mafia clan in Ostia, a seaside suburb of Rome.